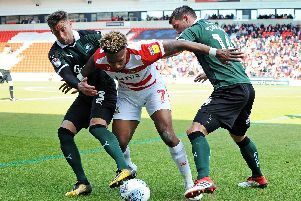 Doncaster Rovers have held off competition from several League One rivals to land much sought-after striker Andy Williams. The 28-year-old was released by Swindon Town after scoring 21 goals last season, a tally that placed him third in the league’s scoring chart behind Joe Garner and Ian Henderson. He has signed a three-year deal with Doncaster. Bradford City, Sheffield United, Scunthorpe United and Millwall had all shown an interest in signing the Hereford-born frontman. Landing Williams is something of a ‘statement signing’ for boss Paul Dickov who has made it his priority to add more firepower to his squad this summer - and it could persuade other players to follow in his footsteps to the Keepmoat Stadium. Dickov said: “Andy coming here is absolutely fantastic. I’m buzzing. He is a striker whose movement is exceptional and a player that is so, so composed in front of goal. “He is lethal with his right foot but can also score with his left and with his head. That was something that was missing last season and if we had that, I believe we would have finished in the top six. “To have this calibre of player, a player who knows what it takes to get in to those play off positions and to stay there is huge for us. “There were a lot clubs interested in Andy, clubs close to us logistically and clubs in the Championship.